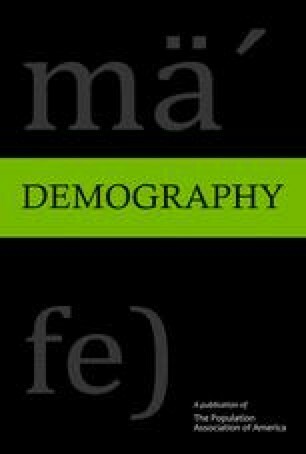 Using recently released cohabitation data for the male sample of the National Longitudinal Survey of Youth, first interviewed in 1979, I conducted multinomial discrete-time event-history analyses of how young men’s career-development process affects both the formation and the dissolution of cohabiting unions. For a substantial proportion of young men, cohabitation seemed to represent an adaptive strategy during a period of career immaturity, whereas marriage was a far more likely outcome for both stably employed cohabitors and noncohabitors alike. Earnings positively affected the entry into either a cohabiting or marital union but exhibited a strong threshold effect. Once the men were in cohabiting unions, however, earnings had little effect on the odds of marrying. Men with better long-run socioeconomic prospects were far more likely to marry from either the noncohabiting or cohabiting state, and this was particularly true for blacks. This is a revised version of a paper presented at the 2001 annual meeting of the Population Association of America, Washington, DC. The research was supported by an Academic Senate Grant from the University of California, Los Angeles. I am extremely grateful for the critical comments and helpful suggestions of Robert Mare, Megan Sweeney, and the two anonymous reviewers.